This node creates a terrain using a Cellular noise generator, also known as Worleyâ€™s noise or VoronoÃ¯ noise generator. This generator samples points across the terrain that act like mini-generator diffusing an elevation around them, thus creating cell-like structures. To add a Cellular noise node, right click in the Graph Editor and select Create Node > Terrain Transformation > Cellular noise. The Scale parameter determines the horizontal scale of the noise. A smaller coefficient gives a higher density of cells; a larger coefficient gives a lower density of cells. 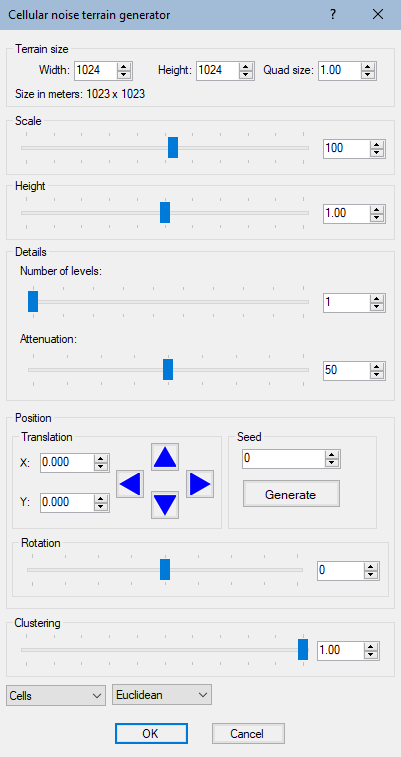 Click Generate to randomly generate a new seed. The parameter â€œclusteringâ€ allows to slightly change the cellular noise generator output by diminishing the influence of some cells. Use it when you want to create more vertical variation in the terrain. This combo-box allows you to the change the way the cellular generator works internally. Every alternative uses the same strategy: it constructs a grid with points sampled all across the terrain. Each of those samples act as a little radial generator. Cells, More cells, and Even more cells create convexities based on the closest, second closest or third closest radial generator. Bumps, also known as â€œF2 â€“ F1â€ in some software uses two radial generators to creates bumps or scales along the terrain. Flats, More flats, and Even more flats force the samples to diffuse a constant height which can be useful when texturing the terrain or defining biomes. This combo-box defines the way the distance from a point to the radial generator is computed. By default, Euclidean distance is used (i.e. the shortest path between two points is the line that pass through them) but alternatives may be used. Manhattan (also known as taxicab distance) does not allow for diagonals. Kingâ€™s move is similar to the way a king moves on a chessboard: it doesnâ€™t cost more to move diagonally than vertically or horizontally..